What do Upstream, The Devil’s Passkey, Mare Nostrum, The Last Moment, A Woman of Paris, London After Midnight, The Old Dark House, The Case of Lena Smith, and Little Man, What Now have in common? In 1967, all were included on a ‘rescue list’ issued by the then-brand-new American Film Institute. Collating the 150 or so important American films presumed beyond salvage or in imminent danger of disappearance, the list dictated priorities for scavengers and preservationists alike. With the Library of Congress acting as an on-again/off-again repository for American films and the privately-funded efforts of the Museum of Modern Art and George Eastman House receiving little exposure and minimal scrutiny, the urgency of such an undertaking was obvious. Some evidently important titles were gone outright: Theda Bara’s Cleopatra, Laurel and Hardy’s Hats Off, Ernst Lubitsch’s The Patriot, Lon Chaney and Tod Browning’s The Unknown. (The latter would eventually be found in the archives of the Cinémathèque française under the familiar but generic heading INCONNU—as in, Unidentified Film.) Undisputed classics like Stagecoach and Scarface (AFI selections both) circulated in wretched 16mm prints, with considerable doubt that prime 35mm elements even existed anymore. 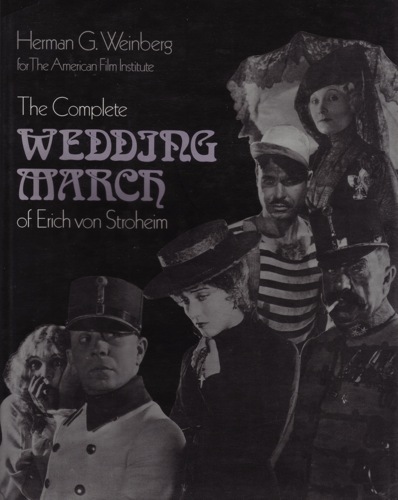 Amateur film scholars held out hope for an extant copy of Erich von Stroheim’s Greed in its complete, unreleased version. As the latter-day Internet Movie Database would advise, check your attics. Long unseen films from the prestigious directors of the twenties—James Cruze, King Vidor, Henry King, Rex Ingram—invariably prove disappointing as they become available again. They are skilled, slick, and yet somehow lifeless, adding nothing to our knowledge of those directors’ work, and if anything, detracting from their reputations …. The eternally frustrating aspect of the film output of the twenties is that we know there cannot be many more (if any) formal masterpieces awaiting rediscovery, nor is there much more time available for recovery. The intensive preservation crusades by U.S. and world-wide archives quite certainly unearthed all the sizable caches of lost films, which still face the expensive procedure of copying for preservation. James Cruze’s highly regarded Beggar on Horseback was one of the films thus saved—at least in part, for some of it had already deteriorated. But from the almost consistent stolidity and disappointment which mark Cruze’s work in this, his most accomplished period (The Covered Wagon, The Pony Express, Old Ironsides, The City Gone Mad)—all 1923-1926—one had the right to expect from Beggar on Horseback notable content but rather dull execution—and this proved to be very much the case. 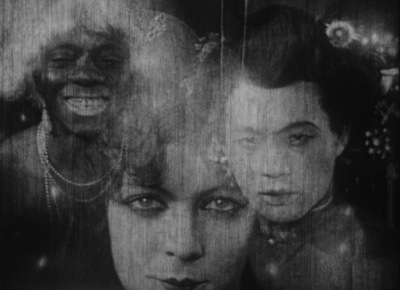 But against such disappointments, one can fall back on films like Smouldering Fires [Clarence Brown, 1925] or William K. Howard’s notable White Gold (1927), a film that predates and blueprints the better-known and bigger productions The Wind (by Victor Seastrom) and City Girl (by Murnau). For Everson, the only filmmaker whose recovered work consistently exceeded expectations was John Ford. For decades, the entirety of Ford’s viewable silent output consisted of The Iron Horse and Four Sons, two commercially important but artistically limited and imitative works. The late 1960s and early ’70s brought a deluge of resurrected Fords: Cameo Kirby, Hangman’s House, and the quite major 3 Bad Men. Miraculously, a print of Ford’s very first feature—1917’s Straight Shooting—was found in Czechoslovokia’s Národní filmový archiv and restored with considerable hoopla and self-congratulation from the AFI. Ford attended a revival at the Montreal Film Festival and segments from the re-translated copy aired on NBC! Richard Koszarski included the film in a 1976 survey called ‘The Rivals of D.W. Griffith’ at the Walker Art Museum —pretty impressive for a piece of accomplished juvenilia that had only resurfaced a few years before. These days, it’s not easy to see Straight Shooting. It’s not lost anymore, but it may as well be for the frequency of its theatrical screenings. A well-maintained archival negative doesn’t equate with a heavily-booked print. The same goes for many of the other rediscovered Fords, including Kentucky Pride, an eccentric 1925 entry (it’s told from the point of view of its titular horse) championed by Ford biographer Joseph McBride. At best, these films are hauled out once a decade in the context of an exhaustive (and exhausting) Ford season at an elite cinémathèque. Had Upstream been recovered in 1970, rather than 2010, it probably would have met the same archival fate. Upstream may be a hotly anticipated title at the moment through an accident of history, but that’s no reason to be cavalier about it. Kentucky Pride notwithstanding, this is one gift horse. Upstream has received considerable press as the crown jewel in an ad hoc collection of seventy-five American films repatriated from the New Zealand Film Archive through the efforts of the National Film Preservation Foundation. Matching the orphan films to new American archival homes, the NFPF has undertaken a very ambitious project. 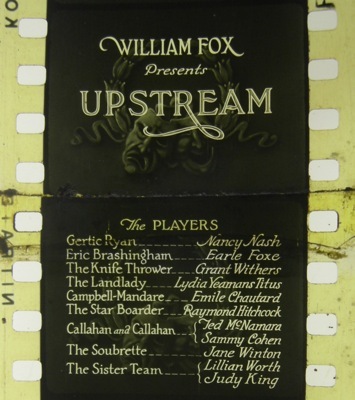 In the case of Upstream, 20th Century Fox got involved and paid for a comprehensive restoration at New Zealand’s Park Road Post Production. 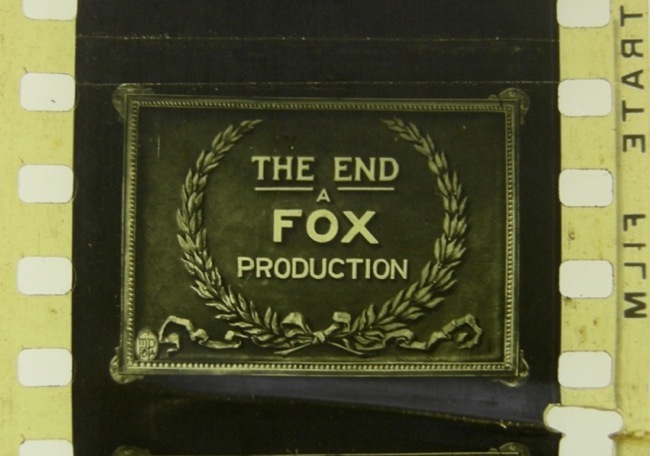 (Because the nitrate copy was unique and justly famous, it was decided to undertake the duplication work in New Zealand, so as not to risk a catastrophic loss during transit.) The preservation negative of Upstream now lives at the Academy Film Archive in Los Angeles; the Academy hosted the American premiere of the restored version in September 2010 and it’s toured some since, opening the 2011 San Francisco Silent Film Festival. Many of the New Zealand titles—but not Upstream—are streaming on the NFPF’s website. The extent to which any of the recent major discoveries, like Upstream or the mostly-complete Metropolis found in Buenos Aires in 2008, were really ‘lost films’ is a matter of some controversy. These were not rusty cans discovered in the proverbial attic of some country bumpkin unaware of the pressing cultural imperative of old movies; these films were sitting in reputed archives with professional inventories, backed by solid, documented chains of provenance. Their survival is not exactly mysterious or random. Morris Jackson of Christchurch was responsible for six titles in the collection. Morris operated Film Services in Matipo Road from the 1960s, selling film equipment, projectors and operating a large 16mm rental library specializing in Fox & MGM titles. In more recent years Morris offered a film-to-video service. Collections of nitrate originally came from the Auckland wine merchant Assid Corban Snr and Invercargill theater owner Warren Sparks. Small places as well as cities have yielded collections: Opotiki, Rangiora, Otorohonga, Wellington, Masterton, and Blenheim. Two nitrate collections were salvaged from auction houses and estates. The largest of these was the Helliwell Collection discovered in a Berhampore house when Mr Smiles (aka Glen MacDonald), who ran a second-hand shop in Wellington’s Cuba Street, stumbled upon the cans of nitrate while clearing the contents of the late Mr Helliwell’s house. Is it an indictment of the archives that these films sat on the shelf so long or a testament to their collection stewardship? These films were hardly unnoticed or neglected, nor were they deliberately withheld from public view. If we misconstrued these films as ‘lost,’ it was largely because we artificially constricted the purview of our search. The case of Metropolis is instructive. Fernando Peña spent two decades tracking down the longest extant cut of Lang’s spectacle before finally verifying the completeness of the 16mm negative held by the Museo del Cine. Though Peña’s discovery earned considerable international attention, the press was less interested in the precarious position of Argentina’s own film heritage. Preservation is inherently polemical. It’s about cultural priorities—it literally entails choosing which films to save right now and which ones might stand to wait a little longer, even if that means they might deteriorate further (and possibly irretrievably) in the interim. The challenge is to save not just the Ford films that win headlines, but the unknown pictures that don’t. Above all, it’s supremely important to show the films to the public. An engaged audience is the best antidote to the apathy that lets films get lost in the first place. The Northwest Chicago Film Society proudly presents the Chicago premiere of the 2010 restoration of Upstream on December 5 at the Portage Theater. The film has not screened in Chicago in over eighty years. It will be accompanied on the organ by Jay Warren. Special thanks to Caitlin Robertson of 20th Century Fox, Brian Block of Criterion Pictures, USA, and May Haduong of the Academy Film Archive. Please see here for additional information. This entry was posted in Blog and tagged 35mm, Editorials, Program Notes, Restorations. Bookmark the permalink.